On the cover this month is the second hoard found under the same building in the North East of England, it’s a fascinating story and contains some rarities. Steve Gaunt reports on a Celtic coin hoard from Croatia and we mark the anniversary of WW1 with various detecting finds from around the country. 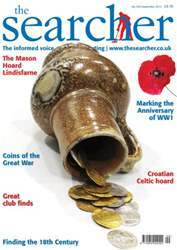 Brett Hammond looks at finds from the 18th Century and Mike Sinclair looks at the coins of the Great War. THere’s of course much more in Identification and Valuation Desk and our other regulars!